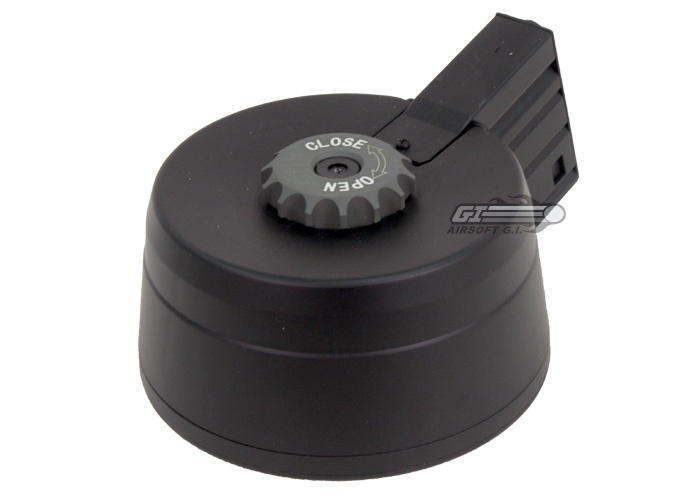 The Echo 1 SR-25 Drum Magazine is powered by rechargeable batteries and holds up to 2000 rounds. It loads through the hatch on the top of the magazine like any high capacity magazine. The magazine is wound by a pressure switch that plugs into the rear of the magazine like headphones into a CD player. This magazine also has an auto winding feature and a sound activated winding feature that will only wind the magazine when your gun is firing. This magazine is designed for use with the Echo 1 ER-25. This magazine may work with other brands of AEG but cannot be guaranteed by Airsoft GI. Will this work for my lancer tactical warlord aeg? it will not. you will need a drum magazine made for an M4 style rifle. the SR25 style is too big and will not fit in the magazine well. Unfortunately, this will not fit an M14. There are currently no drum magazines for M14 models. Will this fit a WE SCAR-H? this drum magazine is m4? Can you also manually wind it if it dies?